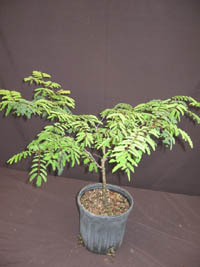 The Caesalpinia coriania (Divi-divi) is a medium size tree from Aruba, very often seen in pictures with windswept shapes near the ocean. The Divi-Divi is quite easy. There is nothing really special in their care. Perhaps just some protection if the temperature dips bellow 35° F. The basic requirements are full to partial sun, average water, and fertilizer. Divi-Divi flowers during the warm weather, but the flowers are not very showy. The really beauty of the plant resides on their delicate fine leaves. 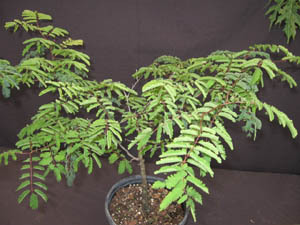 It has beautiful reddish/pink new growth and the shapes that can be achieved by trimming, thus making it one of the favorite trees for bonsai training.